RALEIGH, NC (April 16, 2007) – Stackpole Electronics, Inc. announces a brand new series of UL and CSA approved wirewound resistors. The RWT series incorporates a standard 5 watt wirewound element and 142C, 2 amp thermal fuse in a standard 5 watt vertical mount ceramic case to provide an ideal device for power supply designers. The integration of these two devices as well as their UL (Akaneohm file no. E255350) and CSA (Akaneohm file no. 229946) provides both the resistor characteristics that designers need as well as the safety features they are required to have in a single device. This allows designers to reduce component count and board space used so that they can downsize current designs or add additional features for future products. 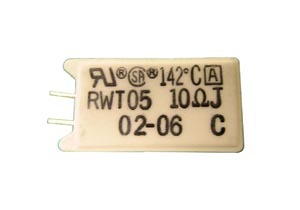 The RWT series type product is a 2 watt rated resistor that also behaves as a slow blow resettable fuse. Once the power dissipation through the part causes the heat generated to exceed 142 degrees C, the part opens and stops the current flow, saving any heat sensitive components in the end product. Once the circuit cools down sufficiently, the part returns to its original state. In contrast, a fusible wirewound is a one time only fusing device meaning even though the part will fuse and protect the end product, it will no longer function after this and will need to be serviced and have the fusible resistor replaced. PTC thermisters also function similarly to the RWT except they usually are less robust, only limit current flow, and are rarely UL recognized. The RWT series is a 2 watt device in a standard 5 watt vertical mount ceramic encased wirewound package (25 mm H by 13 mm W by 9.5 mm D). It is available in E24 resistance values from 1 to 100 ohms and in 5% resistance tolerances. The rated functioning temperature of the thermal fuse is 142C but other thermal fuses are possible. Please contact the factory for more details. Typical pricing for the RWT 2 is $.25 each minimum quantities but is volume dependent. It comes in standard bulk packaging in 1500 pcs per box. Standard lead time is 8 weeks. For more information about Stackpole products, contact Stackpole Electronics Inc. at 2700 Wycliff Road, Suite 410, Raleigh, N.C. 27607; phone 919-850-9500; fax 919-850-9504; email marketing@seielect.com; or visit the Web site at www.seielect.com.